The last 14 months have been so very interesting. I have come across businesses that are thriving, doing fine and barely putting one foot in front of the other. In all of them, they have reached out because they have realized that something needs to change, something needs to be different for their businesses to stay on top, to be on top or move faster into being on top. I applaud each of those business because they are prepared to do what it takes to get to the next level and ask for help. Each of them has realized that in order to do this, there was a need to do things differently, to shake things up, to challenge the status quo and evolve, as scary as that can seem. They then partner with the right experts to bring that about. The last couple of posts on my SuccessPoint Consulting website as well as our DisruptHR Durban website have all been aimed at de-mything the disruption concept. Disruption is not something to be feared. It’s a necessary evil if we are to shake things up and get people and businesses out of their comfort zones and grow. So, what does it mean? Hmmmm.. not stuff you really want to do right? Wrong! This is where innovation and growth live and thrive. I’m not talking about breaking up the business but rather starting small, even though there is a case for starting big. Ever tried to throw a really disruptive thought or idea into a meeting? Haven’t tried it? Well try it – you will be amazed at what comes out. Staff start saying things like – we didn’t think of that, or we didn’t realise we could do that or we didn’t know etc etc. And then watch how their idea’s start coming through – and let them, even if they sound completely off track – let the ideas flow as one idea could lead to another that actually works. Not used to giving staff the reigns – just do it (thanks NIKE) – guide them through the shock and see them blossom! Disruption is the first step to shaking things up and creating opportunities for staff to challenge the way they, you (yes you too) and the business are doing things. They can’t be afraid to do it (check why if they are). It’s in this disruptive state where the people and the business start to evolve – but only if you see it through. Some staff will fall off the bus – that’s ok. It simply means that they were not ready for the evolution. Some will stay and see it through. These are the ones you need. And don’t give up – disruption can be hard, it can be a long process, but the reward is a stronger more sustainable business. You also don’t have to go it alone. Many try and try until they are too exhausted, or the business is so far gone it seems impossible to bring it around. Don’t be stubborn or too proud to ask for help. Help is out there! Asking for it is not a sign of weakness but of strength, so add your strength in your expert knowledge of your product with other experts in area’s that you are not an expert in and turn the page, start a new chapter – hell start a new book! Just don’t wait until it’s too late. At Last – Someone is willing to say it out loud! 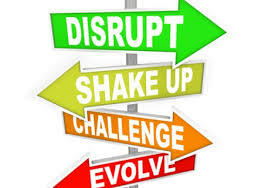 Disrupt HR – Are we there yet?